A salmon holding in the cooling waters of Black Brook rolls on the surface during one recent July afternoon. Thank god for the Miramichi’s many brooks. Drone photography courtesy Ashley Hallihan. After one of the better June’s in a few years we ran out of luck, or at least most of it. July has been hot, but it is the timing of that heat that has been the killer. It actually began the last day of June, and just as the heart of the summer run was scheduled to arrive we had a week of 30C range temperatures. Salmon fishing ground to a halt, and with the exception of a tiny window of opportunity here or there that has been the story since. Most days have seen the water temperatures reach 24 to 25C or about 76F. This is just too warm to catch fish. There have been a few nights when the water temperatures dropped into the 10C/50F range, but not enough of them to reopen the cold water pools. The fish that do enter the river will just move along until they find a cold water pool and then set there unwilling to take a fly, even on most cool mornings. Some of the cold water pools with a great many fish holding in them registered just a handful of fish caught each week with many anglers flogging the water. The couple of days leading up to Sunday July 15 saw morning temps in the single digits, and the water got as low as 17C/66F. It didn’t warm up as badly Saturday with a high of only 23C/73F, and the period of time was enough to encourage some of the fish in the cold water pools to stick their noses up into some of the taking water. Black Brook for one had a good morning on Sunday 7/15 hooking and landing a number of salmon and grilse. Country Haven reported that they had one Miramichi pool upriver from the mouth of the Cains where they did very well for the week. No one was in my camp at Campbell’s because of the heat, but Jason Curtis was checking out the water on that cool Sunday morning, and ended up very glad that he did. He landed a beautiful hen salmon that he estimated was pushing 30 pounds. He was by himself but managed to take this video before tailing it. The fish took one of Ashley Hallihan’s Lime Green Machines. Unfortunately that afternoon saw air temps of 28C/82F, and the water got to 25C/77F. It was an evening for cocktails on the deck instead of salmon fishing. This past week has been mostly cool mornings but warm, sunny days. We did get a little rain earlier in the week, and that was a god send with the brilliant, hot sun we have had ever since. The forecast for the coming week is for more warm weather, but this time with a lot of cloud cover and associated moisture. If we end up getting a good slug of rain and the weather then turns cool we could have some hot fishing. We’ll just have to keep an eye on it. Rain makes a huge difference. First, rain falls from far up in the sky and much of it starts out as snow even in summer. Second, rain becomes ground water that pumps up the springs and streams. The springs have a year round temperature that is within a degree or two of the average annual temperature which is in the low to mid 40sF in Doaktown. That has a great cooling effect on the river all summer long that isn’t apparent. A heavy rainfall that substantially raises the river encourages new fish to enter the river and long-time pooled up fish to rejuvenate some and move into new pools where they are more likely to take a fly. 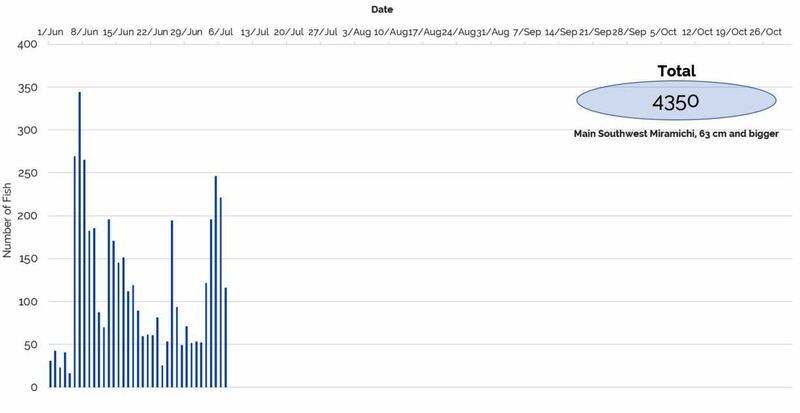 I was going to send this blog out last Sunday, but I thought I’d wait and post the July 15 Millerton trap numbers and compare them to previous, recent years. They still aren’t up yet, though, and now the website isn’t working at all. I’ll update you as soon as I get the info. The general feeling that I get though, is that even in spite of the heat a fair number of salmon have come in whenever there is any kind of break. Both Jason Curtis and David Donahue live in homes overlooking a calm area of the river where they have an excellent view of salmon schools v-ing their way along the surface of the river. In the shallow water that currently exists they are very easy to see. The fish go by primarily at dawn and dusk, and probably during the night too. They have been seeing the schools heading up the river, and it is great to know that they are there, but it would be nice to have the anglers get a crack at them. Their observations agree with the CAST camera counts to date – Collaboration for Atlantic Salmon Tomorrow is a group of academic, not for profit, and industry organizations interested in taking positive steps to help Atlantic salmon populations. The camera results are broken down into two groups of fish, one less than 63cm and the other greater. It is difficult to interpret the smaller fish because it is hard to know if you are looking at striped bass, shad or salmon. 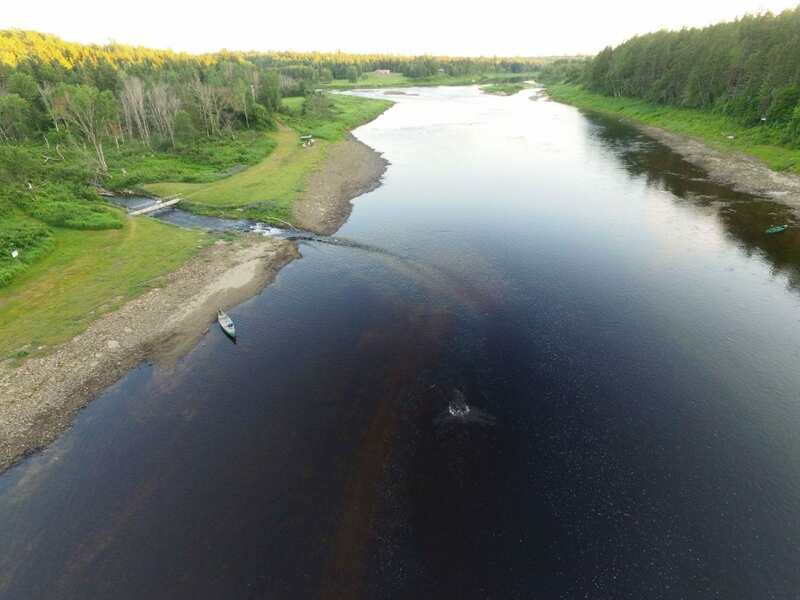 By our experiences after the first of June the vast majority of the 63cm and larger fish passing upstream under the Blackville bridge – where the cameras are located – have to be salmon. We caught a fair number of stripers around Doctor’s Island in June, and none were nearly as large as 63cm. CAST camera counts of fish over 63cm passing upstream at the Blackville Bridge. It is widely accepted now that many rivers of Atlantic Canada have good parr populations, and are pumping out solid numbers of smolts, even from reduced numbers of spawning adults. Nature helps make up this deficit a little since there is more food for the fry that are spawned, and greater survival and growth to adulthood. The reduced numbers of returning adults, grilse especially, are believed to be caused by ocean mortality. But there are many theories as to what is causing that problem. I recently had a telephone interview with well-known, retired DFO biologist Bill Hooper who gave me his own thoughts on this question. He feels that the reduced grilse survival is largely a consequence of the collapse in the Canadian cod fish populations. There had been a small recovery underway with cod, but politicians pressured the regulators to increase the quotas against the advice of scientists, and now the cod have taken another nose dive. Cod were once the dominant ocean predator in Atlantic Canada waters, and it is believed that they kept the populations of many other species in balance. Exactly what species is possibly eating up the smolts during their early time in the ocean is not known – though Hooper says that answering that question should be the biggest research goal of the conservation groups. My fishing friend Bill Utley, also educated as a marine biologist, points to dog fish being a possible issue. Dog fish, a small shark, are vicious predators, that some believe have a roll in reduced herring populations in the Gulf of Maine. I remember falls about 10 years ago when each week of September seemed to bring a big raise of water and a new run of fish up the Miramichi. By the end of the month most of the run had already gone by the lower river, and if you didn’t fish far up into the Cains or the equivalent in the main river you just weren’t catching fish. Last fall was the exact opposite with record low water causing fish to delay entering the river, and the fish that did come in stayed in the lower-river holding pools. So what will this fall be like? Certainly it is too early to know for sure, but clearly a lot of fish that should have already entered the river in July have been discouraged by warm and low water. This is tough on fishermen who planned July trips, but for those who schedule their time on the Miramichi in the fall, this year is tentatively shaping up as something of a repeat. We’ll just have to wait and see. The post Mid-Summer Miramichi Salmon Blog appeared first on Brad Burns Fishing.